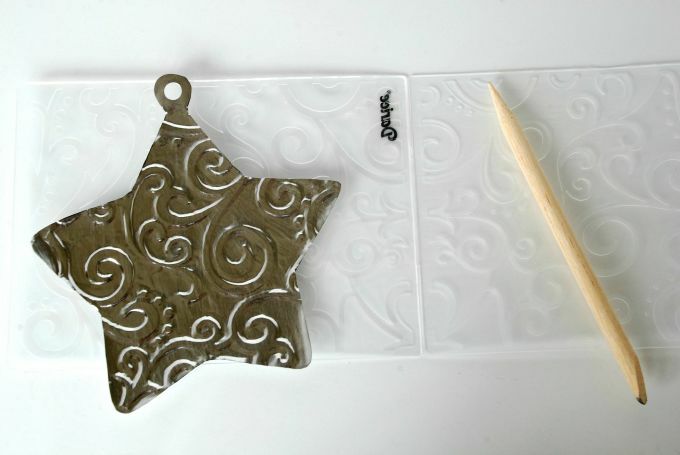 Art Emboss™ Pure Metal Sheet – Aluminum, Medium Weight 9-1/4 x 12 ” comes with a wooden tool. One sheet makes about 6 ornaments. 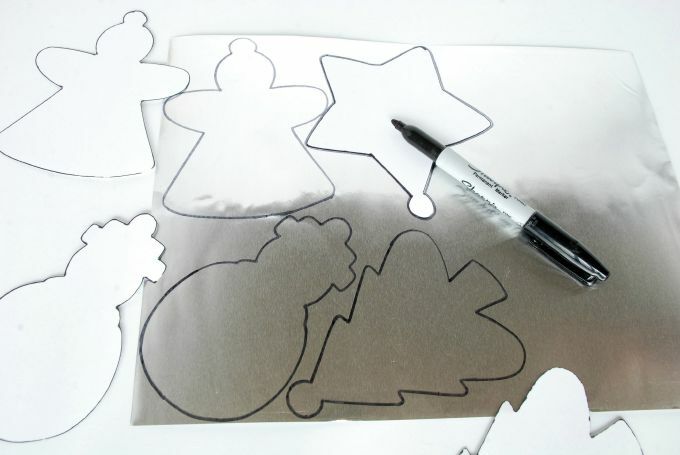 Print the Christmas Ornament – Patterns on cardstock and cut them out. 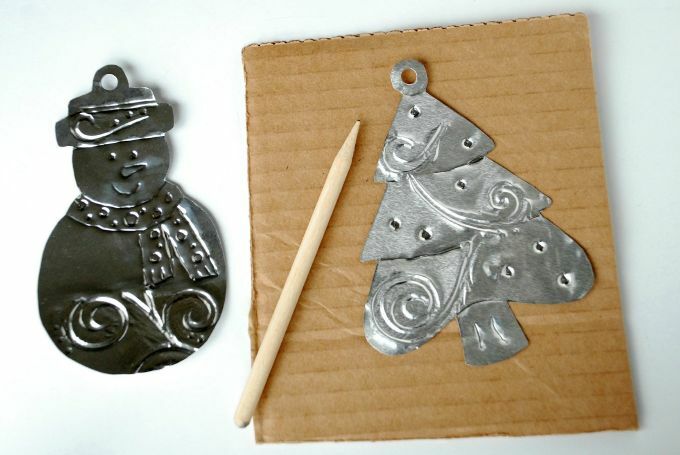 – Smooth out the aluminum sheet by hand or with a rolling pin. – On the more grainy side of the sheet, trace around the pattern with a marker. The metal is delicate so be gentle with it. Even a fingernail can leave a mark. CAUTION: The edges can be sharp so use caution. Precut any pieces for children. – With scissors cut in between the shapes to separate them. Then with fine point smaller scissors cut around each shape. Be careful not to leave any metal slivers. Cut inside the pattern marking lines. Clean off any remaining marks by wiping carefully with a paper towel dipped in nail polish remover. Roll each piece with a rolling pin on both sides to re-smooth it. Firmly hold the aluminum in place on the embossing folder. Then use the flat end of the tool to rub the design pattern onto the metal. Rub the metal in the same direction. And press in closely around every design pattern. 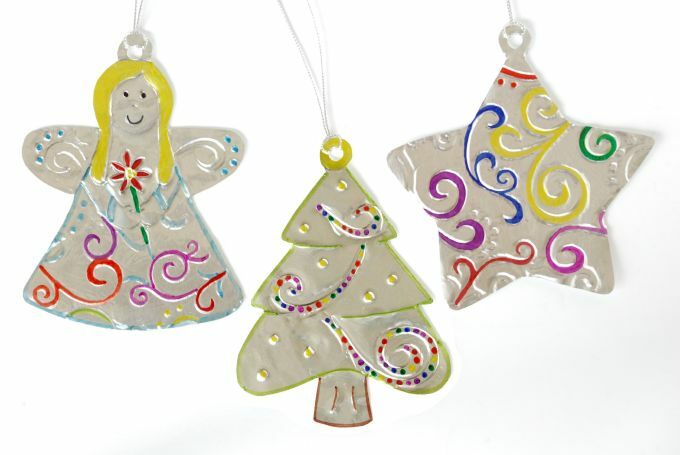 With a pencil, lightly draw details on the ornament. Lay it on the cardboard. Use the fine pointed end of the tool to make detailed marks. To correct any detailing errors, turn the design over. And re-smooth it with the flat end of the tool or a rolling pin. Color in details using the markers. Going over a color twice will make it darker. Let it dry completely. If there is a coloring mistake it may be removed by using a cotton swab dipped in rubbing alcohol. Punch a hole in the top with the hole punch to hang it with a ribbon.